MANILA, Philippines – The March 2018 civil service exam results (career service examination - paper and pencil test or CSE-PPT) together with the full list of passers for Region 15 (CARAGA Region) for the professional and sub-professional level exam are released online on May 16 or 59 days after the exam. The adjustment of the target release date of results was due to the increasing number of examinees. "Please standby next week for the release of results. 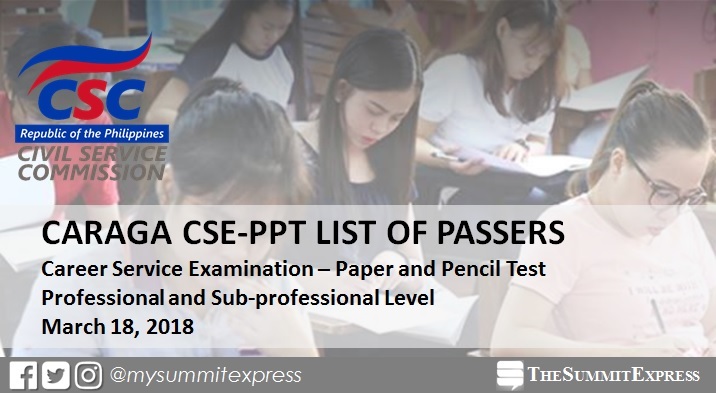 Results of CSE-PPT are released 60 days after the date of exam," the Civil Service Commission (CSC) said on Friday, May 11. The CSC administered the CS exam on March 18 in all regions nationwide ( equivalent to at least 61 testing centers). The names of Passers for CARAGA (Agusan del Norte, Agusan del Sur, Surigao del Norte, Surigao del Sur and Dinagat Islands) for the first CS examinations this year is posted below. The career service examination is a general ability test designed to measure an individual’s preparedness to enter government service. The Professional level lasts for three hours and 10 minutes, while the Sub-professional level, for two hours and 40 minutes. Passing the career service examinations would result in the conferment of either Professional or Sub-professional Eligibility that is needed, among others, for permanent appointment to corresponding career service positions in the government except those that involve practice of profession or are covered by special laws.